The HIMOINSA Team riders complete a stage characterised by tactics, with the goal of conserving both bike and body for the marathon stage, which will entail the rally’s longest timed special without assistance. Gerard Farrés makes good use of his expertise to defend his position inside a Top 10 where there are many changes yet again. Dani Oliveras keeps his pace up and finishes another stage among the day’s fastest, taking an important leap in the overall. Uyuni (Bolivia). After the day off in La Paz, Dakar 2018 has resumed its way into the second half of the race. Additionally, it does so with one of the biggest challenges of this 40th edition: the La Paz-Uyuni-Tupiza marathon stage. In just two days, the riders will cross the Bolivian country from North to South without receiving assistance from their mechanical teams. Today, the objective was to be as fresh as possible at the finish line in Uyuni, after completing one of the longest specials of the whole rally: 425 kilometers in which the abundant rain, mud and altitude (again with passages over 4,000 meters) have been the main obstacles to overcome. Once across the finish line, the riders will spend the night alone, with no more spare parts than those they have been able to carry with them, and having to repair the bikes themselves to face the second half of this marathon stage, where an even longer 498 kilometer long special awaits them. 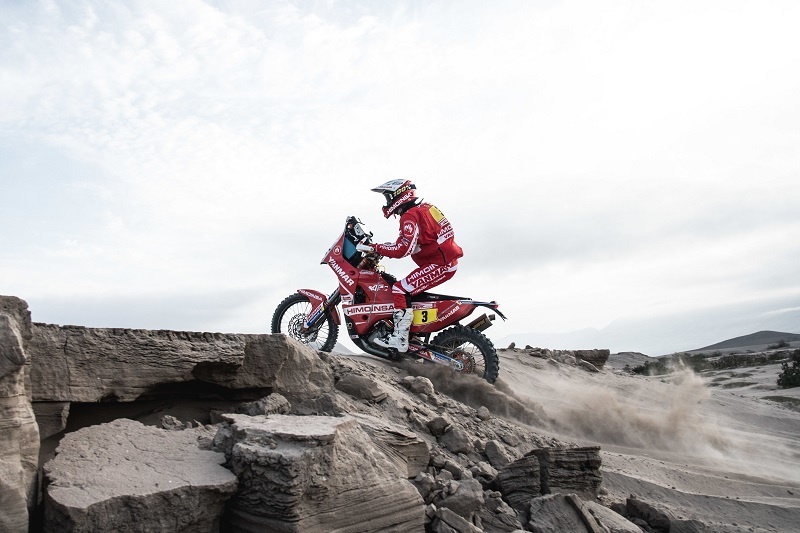 Therefore, strategy was one of the key factors to this seventh stage, where the management work from Miguel Puertas and the enormous experience of Gerard Farrés, has allowed the rider to defend his position in the Top 10 in a day filled with constant movement in the leaderboard. Equally smart and cunning was Dani Oliveras who, while continuing to ride at the pace of the Top 10 for the third consecutive day, which has led him to climb four positions in the general classification, has managed to conserve his forces and his mechanics to get to Uyuni in great condition and face tomorrow’s second half of this extreme stage. The rest of the HIMOINSA Team applied the same approach, with the objective for Marc Solà, Iván Cervantes and Rosa Romero being to reach Uyuni’s finish line without complications and without giving up time in their respective classifications.